As a member of the ASteraceae or Compositae (aster family), this species has common relatives such as chrysanthemum, aster, sunflower, strawflower, lettuce, endive, Zinnia and Ageratum. Native to Europe, Northern Asia. Over 50 single- and double-flowered cultivars of this perennial are known. Leaves are glossy, divided and up to 12 inches long. Flowers to 4 inches in diameter with white ray and yellow disk florets. When held wet or dry between 32 and 50F, no difference in vaselife was noted between wet and dry at a given temperature. However, there was an advantage for wet holding when held at 55F. Therefore, dry storage/transport is recommended unless high temperatures (>50F) are possible. Considered to be a cross between L. maximum and L. lacustre. Might be better known as Chrysanthemum maximum. From Greek “leukos” for white and “anthemon” for flower. Division of clumps should be performed every two or three years under garden settings to maintain plant vigor. The cultivar ‘Becky’ was chosen as the 2001 plant of the year by the Ohio Nursery & Landscape Association. 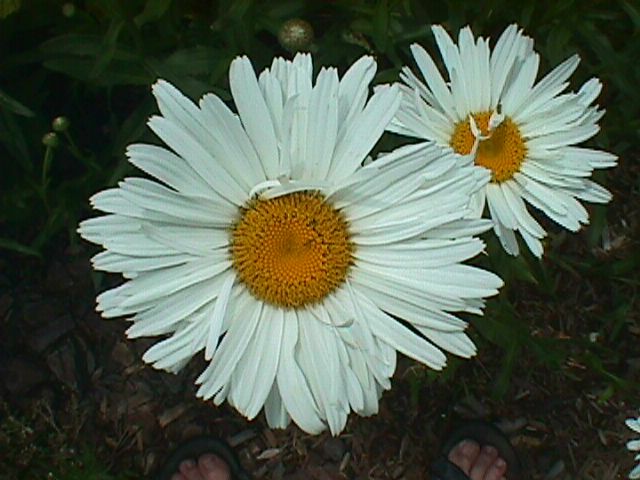 It reaches 3-4 feet by 2-3 feet wide, produces 3-4 inch white flowers with yellow centers in July.